100 free books this weekend! There's a great new promotion happening this weekend. Over a hundred science fiction and fantasy books being given away for free! From unknowns to bestsellers, this is a fantastic way to discover and try out new authors, and it will cost you nothing, nada, zip. With so much on offer, there's bound to be at least one book that catches your eye, so add it to your library while you can. Tons of action, mystery, romance and even some box sets, and it's available for Kindle, Nook, Kobo and Apple readers. Did I mention it was free? Yes, free stuff. Grab. Read. Enjoy. Imagine, if you will, that you are on the run from zombies. The world has gone to hell, you are with a group of survivors and you need to find a place to hole up. Somewhere defensible, somewhere safe from the clawing hands and the bared, blood covered teeth of the undead hordes. Then you come across a castle. But not just any castle. 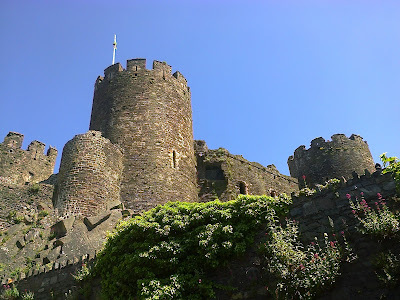 Conwy Castle, with its intact walls and towers, and an accompanying town that has its own defensive walls - again, still intact - and one of the few places in Europe that hasn't lost them to the ravages of time. In the light of the Lionel Shriver controversy, I was reading a post on a writer's forum with increasing disbelief, as a white writer basically begged for advice on how to write black people into her story, because she didn't want to be seen as culturally appropriating black culture. Other writers defended the concept of cultural appropriation, where the dominant white culture is criticised for its audacity to do 'black' things like rapping or wearing corn-rows, and Lionel Shriver has already been criticised for saying there's nothing wrong with a white author creating a story from a black character's perspective. Student Unions in the UK have already hit the headlines for banning sombreros or Native American headdresses at parties, because it's 'offensive', and a blatant example of cultural appropriation, so this kind of thing is all the rage at the moment. 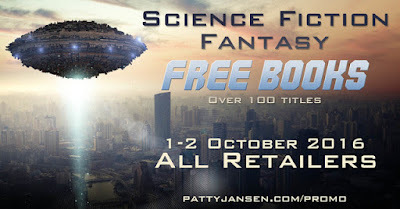 This weekend you get the chance to choose from over a hundred books and authors, thanks to a massive promo by author Patty Jansen. In cooperation with many other authors, she's offering readers the chance to buy science fiction, fantasy and horror books on the cheap, for two days only. So if you fancy a new read, check it out. With so many books to offer, you're bound to find something you'll like.